We use paper for all sorts of things, at work and at home. Printing off work, reading the daily newspaper and cleaning up are three common uses. With some thought though we can use a lot less paper and we can make sure we get plenty of use out of the paper that we do use. Despite the fact that paper can be recycled, recycling still uses a significant amount of energy. The paper industry consumes large amounts of both energy and water. By re-using paper you will be conserving energy, cutting down on your waste and also saving some money. Here are ten of the top ways to reduce and re-use paper. 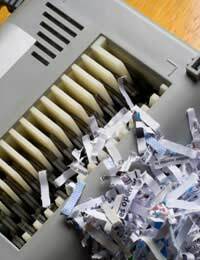 Use a paper shredder if you have one, or scissors, to shred up waste paper or newspaper as it makes excellent bedding for animals. If you don’t have a pet of your own see if any friends do or donate paper to a local animal shelter who will probably be very glad of it. Get to know your printer and photocopier if you use them. If you work in an office someone should be able to talk you through many of the instructions. Learn how to print and photocopy double-sided as this saves loads of paper. There are also lots of tips and tricks you can employ to fit more on a page, such as setting the document up to print 2 columns per page. You may be surprised to know that old newspaper is great for cleaning and shining windows. Avoid pages with coloured adverts though. You can wash your windows with a solution of half vinegar and half water, apply it with scrunched up newspaper and then wipe it dry with a clean sheet of newspaper. Newspaper is said to give clearer and sparklier windows than paper towels. You can also use old newspaper to wrap, store and protect fragile items. Crockery, glass and pictures wrapped in a few sheets of newspaper will break far less easily. If you know someone who is moving house newspaper will be invaluable to them. Save any paper that has a blank side, or even half a blank side. You can use this paper to staple together to make note books and telephone message pads. Do this in your office and at home - you’ll probably find that you don’t need to buy a notebook for years! You can also use scrap paper with a blank area for kids to draw on instead of buying expensive drawing books. If you’re creative (or can trace!) you can make home-made colouring books for your children on scrap paper too. Schools and nurseries may be glad of scrap paper for children to write and draw on so ask around if you don’t have any children yourself. Leftover wrapping paper makes excellent collage material for yourself or for children. If the wrapping paper is still intact you can keep it to wrap presents later on. A quick iron and careful removal of sticky tape will make it as good as new. This will save you some money too as nice wrapping paper is not cheap. Wherever possible think about whether you can email or call rather than sending a letter. This not only saves paper, but also envelopes and postage fees. Email is used for a lot of official business these days including job applications and invoicing. If you have signs and notices printed up at work, laminate them. This will make them last a lot longer and prevent them having to be reprinted regularly because they’re tatty. The first one you should get laminated is one to go near the printer about saving paper! Use tea towels and dish cloths rather than paper towels. A regular boil wash will keep them germ-free. i want to use paper wastes for the betterment of our surroundings.please help me.